Description Hand crosses like this one are used by priests to bless the faithful. This boxwood carving, set in a lavishly decorated enamel frame, shows God the Father (top), the Three Angels visiting Abraham (center), Christ's Ascension (below), the Annunciation (left), and Christ's Baptism (right). 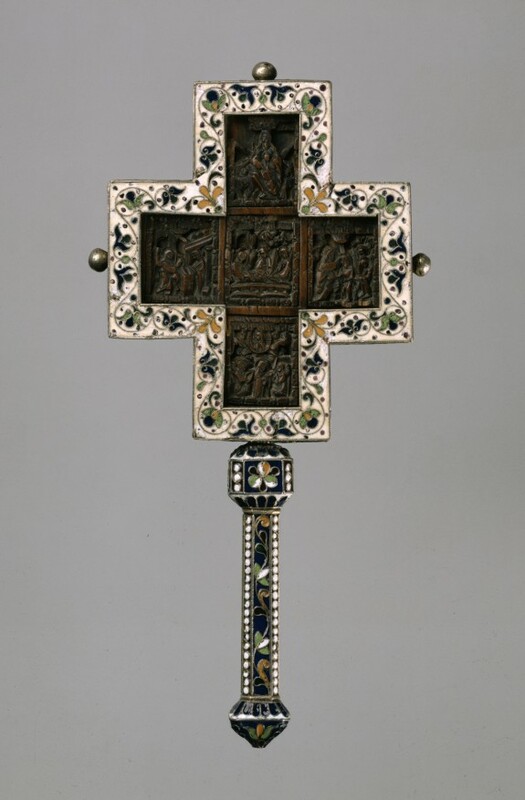 The back of the cross is entirely covered with enamel ornament. The use of delicate patterns against a snow-white background identifies this frame as a work from Velikii Ustiug, a town in northern Russia that was a major center of enamel manufacture. Russian Art: Icons and Decorative Arts from the Origin to the Twentieth Century. The Walters Art Gallery, Baltimore. 1959-1960. The Arts of Man. Dallas Museum of Art, Dallas. 1962. A Millennium of Christianity: Russian Art from The Walters Art Gallery. The Walters Art Gallery, Baltimore. 1988-1989. Russian Enamels. The Walters Art Gallery, Baltimore. 1996-1997. Provenance Leon Grinberg ("A la Vieille Russie"), New York, by purchase; Walters Art Museum, 1951, by purchase.